Igloo Product Corp., the number one cooler manufacturer worldwide, has signed a brand licensing agreement with Taiwan-based manufacturer First Design Global, Inc. (FDG Brands). The agreement allows FDG Brands the merchandising and production rights to certain Igloo trademarks, logos and brands for their products within the Housewares category. This collaborative partnership with First Design Global is one strategy in expanding Igloo’s presence in the home and housewares industry. The Igloo licensed FDG Brands product scope is primarily limited to Housewares Tabletop, Entertaining and Kitchen products. Expected Igloo branded product offerings include insulated beverage cups, containers and dispensers; plastic and melamine tabletop, serveware, drinkware and accessories; and other plastic kitchen, entertaining and storage accessories. FDG Brands is backed by Tzeng Shyng Industries Corp. (T.S. Group). The T.S. Group has more than 30 years of experience manufacturing plastics and has been leading the industry in injection molded plastics and melamine tableware. For further information or to make an appointment to view the new products at the 2014 International Home and Housewares Show, contact Katie Davis at kdavis(at)igloocorp(dot)com. Founded in 1947, Texas-based Igloo Products Corp. is today an international designer, manufacturer and marketer of outdoor products that make the outdoor experience more accessible and fun. So whether it’s on the water, near the water, on the trail, on the hunt, in the mountains or just around the house for family fun, Igloo goes where you go and makes the experience better. 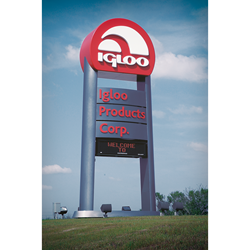 For more information on Igloo, visit the company’s website at http://www.igloocoolers.com. About First Design Global, Inc.
FDG Brands is a new venture backed by the strength of Tzeng Shyng Industries, a global leader in injection molded plastics and melamine manufacturing, focused on designing, marketing and manufacturing industry-leading home products under the Igloo Brand.